With the uprise of 3D graphics that has persisted through the medium since the days of the PlayStation and the Nintendo 64, there has been a small demand for a return to the 2D sprite work that persisted through the medium because of the limitations of the hardware. This rise in technology meant that all 2D sprite games were created out of personal choice, which is something most people don't want to do. In this generation, 2D sprites are the go-to aesthetic of choice for indie games such as Cave Story, Fez, Crimson Clover to the point where 2D sprites and Indie games might as well be synonyms. If you were asked to name a Japanese developer that kept to this style then you could point to the large amount of JRPG's that continue to be released for the PSP to this very day. With western developers, the two major companies are Wayforward and Capybara games. 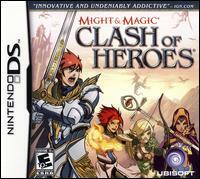 In my eyes Wayforward have a very hit-and-miss gameography (Their most recent games have been better but Double Dragon will probably break that streak) However Capybara are best known for Critter Crunch and, most importantly, Might & Magic: Clash of Heroes. Might & Magic is a series of PC role playing games that are about as famous as the Ultima series as PC WRPG's in terms of evolving the gaming medium. 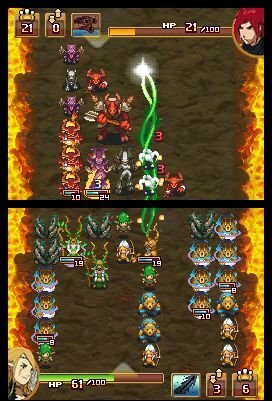 Clash of Heroes, on the other hand is a puzzle/RPG game that contains some of the most satisfying and simplistic gameplay on the DS. The game itself is rather odd in its creation. Might and Magic, like Ultima, was mostly irrelevant in this decade of gaming (the last installment was released in 2002) so some might say that a return to this style of game would be refreshing for true for the next wave of PC hardware. This makes the choice of Cabybara games all the weirder as Ubisoft hired them to make a new installment in the series. While the game play is best explained as a puzzle/RPG, that sells the genius of the game rather short. At the start each player is given an assortment of units in a grid that's reminiscent of a Tetris grid. Each player is also given a life bar that allows them to sustain a fixed amount of damage. When three units are aligned vertically they form an attack formation that charges at the enemy and if there are no other units blocking their path then they inflict damage on the player. Alternatively, when three units align horizontally they form a defensive wall that protects from oncoming attacks. 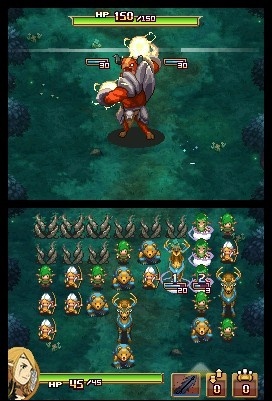 This gameplay evolves over time as new units with special abilities enter the fray along with their commanders who have special powers that can be exploited to gain the tactical upper hand (other options such as sacrificial fusions also keep things fresh). From a graphical standpoint, the game looks stunning. The actual character portraits have a pseudo animé style that stands out from anything else on the DS to the point where it's worth going through the game just to see what creative designs Capybara have come up with. This also ranges to the incredible sprite design of the units, which almost makes it a shame to get rid of any of them to attack as they're all so well crafted. If anything, the worst part of this game is the Might & Magic brand it's attached to. The story is beyond generic, with decent characters put into the most bland interpretation of J.R.R Tolkien's work which I reckon was a Ubisoft mandate rather than anything to do with Capybara (Superbrothers illustrates that Capybara can write a good story if necessary). The linearity of the game might also be troublesome as all of the interactive parts are clearly checkpoints which adds the same problem of a closed world with no room to explore (The Legend of Zelda: Spirit Tracks is a good example of this). That being said, the negatives of this game are rather superficial and easily ignored as the gameplay more than makes up for it. 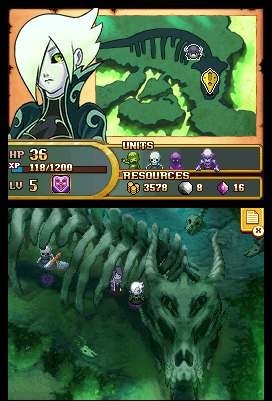 For anyone interested, the game is available for the Nintendo DS and it also received an HD port for the Xbox 360 to make all of the beautiful graphics even more shinier (I still prefer the DS version due to portability and less loading times). Clash of Heroes is a literal clash of intuitive puzzle design (something that is almost lost in this generation of bland, derivative puzzle games) and a great presentation that makes it appealing to almost anyone for its accessibility and ease of use. Highly Recommended.